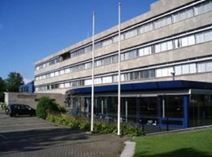 In one of Tilburg's most prestigious buildings these offices are situated in the heart of Tilburg next to the train and bus station and close to the local shops, restaurants and hotels. The city is home to numerous national companies and it is the third largest university city in the Netherlands. Eindhoven Airport is also just a 25 minute drive from Tilburg's city centre. Tilburg is a fast growing city, at which your company will surely benefit from an abundance of up-and-coming business districts. This business centre specialises in offering office units, virtual office services and meeting rooms in a central location in Tilburg. The building has outdoor parking and is easily accessible with the A58 motorway close by and public transport links in walking distance. It is close to many amenities and attractions, including shops, fitness centres, theatres, and parks where you can relax during breaks.